Unfortunately, it is common for many brethren to over encourage the notion that trusting in God includes by default, an affirmed response by God to our expectations, which we pray for. In other words, many brethren say that just because we trust God, we will not only get what we pray for, but that we should actually expect to get what we pray for. Greg Koukl made a great point regarding this notion during the podcast. He spoke to the caller about the common practice of prayer groups who ask, “Who had prayers answered this week?” And after getting several praise reports, the group then affirms that trusting in God is the reason for the affirmed responses from God. Now, let’s be clear about something. But, is always having the expectation that our requests will be answered by God in the affirmative, just because we trust in God, a proper presumption? Greg went on to say, “But… many times it is not the way God chooses to deal with it.” (Meaning, answering our prayers in the affirmative is not usually the way God chooses answer.) Greg then references Colossians 4:2-4, where Paul is writing from prison. Do you see the similarity? Paul, here, also does not pray for personal gain, but for the Gospel to go forth. “Especially the last three years, there has been a dawning realization in my own life. Now, this is personal. That God’s intension is not to remove us from the difficult circumstances we find ourselves in, but rather to redeem those circumstances for the thing that He actually promised to do in our life. And here, I am going to cite a very well known verse, but I am going to say the whole thing, because it is the second half that informs us on the meaning of the first half, and it’s from Romans 8. Boy, you can count on this. God’s do’in it man! So, most people will cite that, you know? Those of us He selected, He’s pulled out, He’s drawn to Him, He’s made His own. Now, let me back up one second, because he is talking about people who have been suffering unjustly. They’re suffering unjustly, this is a bummer. ‘I didn’t deserve this!’ So, he’s going to address that, right? Ok, so there’s the circumstance, the set up. Now, what does he say next? Greg then again went on to clarify that he is NOT attempting to diminish the fact that God does sometimes answer our prayers for something to happen which we want to happen. God does do that. “Are you kidding me? See, what we think is that God is just going to sprinkle some pixie dust and… ‘Here you go! You’re transformed!’ No, He DOESN’T GIVE these things. He TEACHES these things. He teaches these things through the hardship of life. We’re asking for something to be given to us. It’s not given. It’s grafted in, it’s built into us over a period of time. And this is the reality of walking with Christ. Think of 2 Corinthians 4. This passage is one of my favorites now. At the end of the chapter, Paul is describing some of his woes. Look at what he says about putting it in perspective. Well, the circumstances aren’t changing. Something is changing inside of him, and that’s what he is referring to. MOMENTARY. It’s just a little while and it’s not very bad. What do you mean, a ‘momentary light affliction’? Did you just read what he wrote there in chapter four, and then later on? It doesn’t sound like ‘momentary light’ to us. But see, Paul is putting it into perspective. And so, time and time again, the New Testament calls us in the midst of trials and difficulty. 1 Peter is written to suffering Christians. 1 Thessalonians, 2 Thessalonians, written to suffering Christians. Colossians, written by Paul when he was in jail. 1 and 2 Timothy, written by Paul when he was in jail. Hebrews, written to suffering Christians. And here, in 2 Corinthians, Paul is putting in perspective his own sufferings. This is a major theme throughout. We are to trust in The Lord. Not in the things He will give us, that are incidental things we are praying for. But, our trust has to be in Him. And so, more and more my prayer has been, and I’m not trying to wave my flag like I’ve got this worked out, but I think this is part of the pattern. More and more my prayer is, in the midst of this trial, I’m going to ask for what I want, ok? I’m going to ask for God to act and change the things that I think should be changed. I think that’s what it means, BIBLICALLY, to trust in The Lord, regardless of what happens. Greg talked about the fruits of the spirit; how they are taught to us by God, and not given. Such makes sense if you really think about it. How else do we gain love, joy, peace, patience, kindness, goodness, faithfulness, gentleness, and self-control? 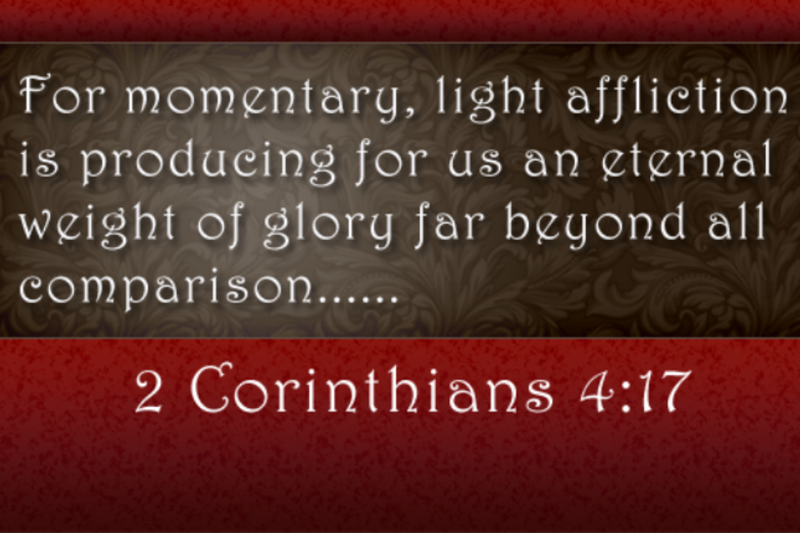 (Gal 5:22-23) We learn such things through our “momentary light afflictions”. Like Christ, we learn obedience by what we suffer. The murder of Stephen was the beginning of a wave of persecution that forced many believers to leave Jerusalem. The Bible says concerning these people, “Now those who were scattered went about preaching the word.” Many Christians in the Middle East have been forced to flee from their homes. We should pray for these people and do all we can to help them but among our prayers we should pray that they will preach the word just as the first Christian refugees did.